January 14, 1559. The eve of the coronation of the fifth and last Tudor monarch, Elizabeth I. 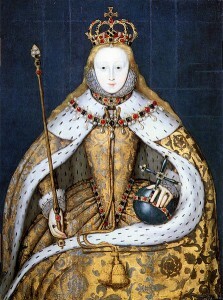 The English people looked to the new queen to end the turmoil that shook the nation under her sister, Mary I. They looked to her to bring their country into a new and glorious age. But most of all, they sought religious freedom, for which had so long been stifled. This was a new beginning for England. And at the forefront of it all, the daughter of a woman named Anne Boleyn. The life and death of Anne Boleyn did not just make an impact on history, it altered the face of it completely. She was strong, courageous, ambitious, beautiful and intelligent. However in my opinion, her greatest contribution to the world was a seed of her womb; her daughter, who would become arguably the greatest English monarch of all time: Elizabeth I. On September 7, 1536, Anne Boleyn lay in childbed, staring down at a healthy infant cooing in her arms. This child was not the much wished for son and heir that her husband, Henry VIII so desired, but a girl, baptized after Henry’s mother, Elizabeth of York. A girl. One can only imagine the thoughts tumbling through the mind of Anne at this time. Perhaps feelings of happiness of being safely delivered of a healthy child. Maybe disappointment that the child was not a son. And certainly doubts and fears about what the future might hold for her and the baby that slept in her arms. One will never truly know what she was thinking that day. But history has shown us that the child she held, this helpless and innocent baby girl, would solidify her name in history forever, and would make her unforgettable. On January 14, 1559, the city of London heralded the new Queen of England with celebrations and pageants in her honor. As Elizabeth’s procession reached Gracechurch Street, the first of the pageants was presented to her: a three-tiered platform depicting the Tudor dynasty, held together by Unity and Concord. At the base of the tier were sitting King Henry VIII and his new queen, Anne Boleyn, shown together for the first time in twenty-five years. Anne was no longer erased from the world, but renewed. She was no longer a subject to be forgotton, but heartily remembered. She was, at long last, vindicated. At Anne’s final speech prior to her execution she said, “If any person will meddle with my cause, I require them to judge the best.” I hope I have done so with this article. Thank you Anne, for giving the world Elizabeth I. You shall be etched in our minds forever, and your legacy will never die.